One of London's busiest stations seeing 123 million people a year pass through. 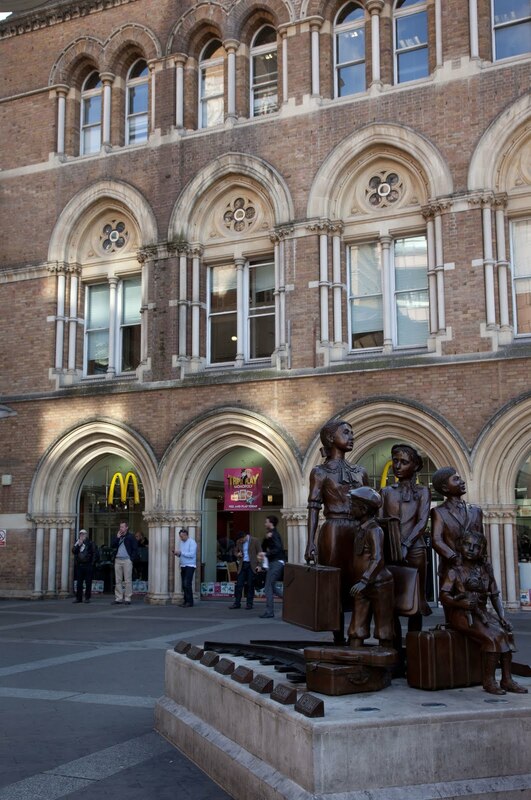 This entrance to the station has a sculpture as a memorial to the 10,000 Jewish children who were brought to the UK a few months prior to the second World War from Nazi Germany, Austria, Czechoslovakia and Danzig. They were placed in foster homes, hostels and farms. I am learning so much...just by reading and looking at all the beautiful photos in your blog. Thanks. Yes but what station is it???? I've never been to Liverpool Street Station - the sculpture looks so poignant. I've been under Liverpool Street station lots of times, but only emerged overground twice. 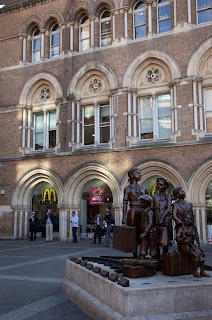 I love the sculpture; shame about the MacDonalds! i have even been in this very McD and didn't notice the sculpture. shame on me! you might like to give the post its title: Liverpool Street Station. I see earlier comments have noticed the the American embassy (as my wife calls them).